The "Alaska Grown" label has long been touted as a boost for local agriculture. The iconic logo is stamped on products produced around the state – everything from hot sauce to peonies to potatoes – to promote local Alaska businesses. So why won't you see the label on marijuana? One of the hallmarks of commercial marijuana in the state is accountability – each cannabis plant is tagged and traced from seedling to sale. Strict rules around ownership means businesses are Alaska-run. It's "one of the only crops that is grown here and sold here and stays here," said Tara Bass, owner of The Remedy Shoppe in Skagway, a marijuana retail store. Bass applied for the Alaska Grown label, housed under the Division of Agriculture, a few months back. Two other marijuana businesses did too, although one has since withdrawn its application. Those applications are on hold, said Johanna Herron, market access and food safety manager with the Division of Agriculture, which oversees the Alaska Grown program. Don't expect them to be approved anytime soon. "We receive so many federal funds, we wouldn't want to jeopardize those," Herron said. Bass wasn't surprised; the decision didn't really bother her, she said. 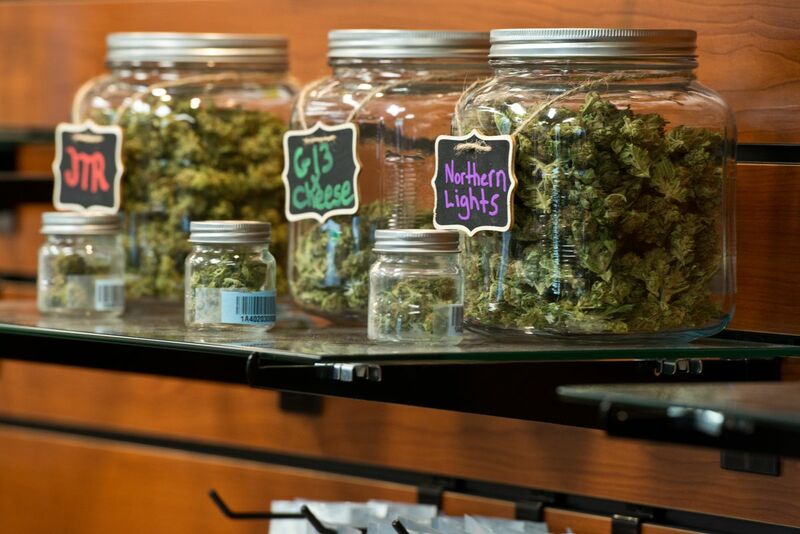 But the Alaska Marijuana Industry Association put out a statement last week deriding state programs that provide benefits to other Alaska businesses but take a hands-off approach to the cannabis industry. "It is simply arbitrary that some programs are singled out and withheld from licensed marijuana establishments," the statement says. "It is unconscionable that the state would license and tax establishments and not grant them full access to services in Alaska." Marijuana businesses are also barred from posting on the state-run job site, Alexsys. The job site is fully funded by federal dollars, which would be at risk if cannabis businesses were allowed to post jobs, said James Harvey, assistant director to the division of employment and training services. Both Herron and Harvey asked their federal funders – the U.S. Department of Agriculture and U.S. Department of Labor, respectively – for clarification on the issue. The USDA has yet to provide a response. The Department of Labor pointed Harvey toward existing federal laws on controlled substances. The Alaska Grown program and Alexsys site are two examples of a larger issue: With marijuana illegal under federal law and simultaneously legal under state law, there's no clear line on how state agencies should treat cannabis. Take the Alaska Marine Highway System. The state ferry system also receives federal funding and travels through federal waterways. But it has developed a different policy than the examples above. For small amounts of marijuana – anything less than an ounce – the ferry takes a relaxed approach. A person spotted with a small amount of cannabis aboard one of the vessels would be told to put it away, said Meadow Bailey, spokesperson for the Alaska Department of Transportation and Public Facilities. But anything over an ounce would be reported to authorities, Bailey said. That includes marijuana businesses attempting to carry pounds of cannabis on board. Bailey said the agency worked with the Alaska Department of Law to develop its policy, which represents an attempt to uphold state law but also stick to core federal priorities. "Every entity acknowledges and realizes that … there is conflicts between the two," Bailey said. If an overarching policy exists that state agencies should adopt, Alaska Department of Law isn't saying. Spokesperson Cori Mills declined to say which state agencies it had worked with in developing marijuana policy, and what those recommendations may be, citing attorney-client privilege. Cannabis businesses say they want access to basic services. Access to bank accounts is the largest issue, they say. Strict federal guidelines technically allow financial institutions to work with the industry but the rules are burdensome and complex. That means cannabis transactions are often cash-only – a liability and a hassle, businesses say. Cary Carrigan, executive director of the Alaska Marijuana Industry Association, said state programs are barring businesses for a simple reason. "It's just that people are scared," Carrigan said. Meanwhile, the Department of Environmental Conservation's Pesticide Control Program is reaching out to the marijuana industry – not in spite of but because the program receives federal funds, said Karin Hendrickson, environmental program manager. Hendrickson is trying bring marijuana businesses into compliance with federal law on pesticide use. "We don't really enforce over what people grow. We enforce over how they used their pesticides," she said. Hendrickson plans to have a booth this weekend at the Cannabis Classic, a marijuana trade show in Anchorage. She isn't worried about losing federal funding because she's engaging with the industry. "We're not the only state going through this," Hendrickson said. For Hendrickson, it's about following the law but also about safety. "We also know … people have been growing for a long time, so now we have the opportunity to be a little more out front and say, 'If you're growing, here's what you need to know,' " Hendrickson said.